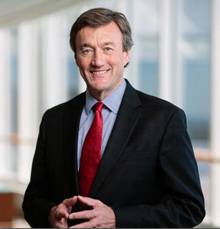 Sara Murray, Wall Street Journal Live reporter, interviewed John Noseworthy, M.D., CEO at Mayo Clinic, during the Wall Street Journal CEO Council in Washington, D.C. She asked Dr. Noseworthy how the Affordable Care Act will impact health care in the United States. He emphasized that the ACA is a step in the right direction but doesn't address the key issues facing Americans — fragmented care, uneven quality, and a broken reimbursement model. Dr. Noseworthy laid out three paths our nation's health care system should follow: 1) payment reform; 2) modernize how we deliver care to reduce costs and reach patients in rural communities; and 3) invest in medical research. Watch the video to learn more about Mayo's vision for the future of health care.